Ace your interview and secure your dream job! What interviewers want on your resume? What to wear and bring to your interview? Let this elegant design portfolio help you remember and storage them! 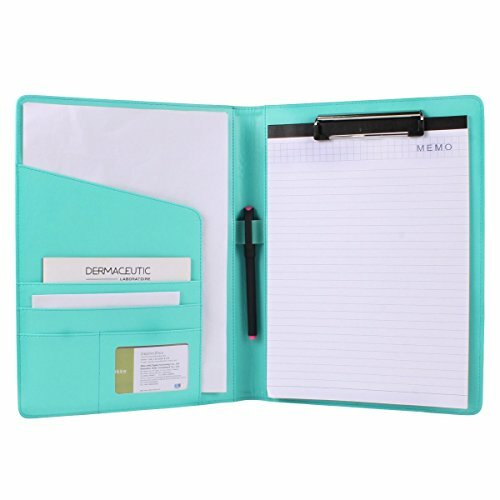 FUNCTION MEETS STYLE: Elegant design featuring convenient, safe pockets ideal for documents, business cards, travel tickets, pitch proposals and resumes. Including a pen holder and refillable writing letter paper. PREMIUM QUALITY: Ideal for today's hectic business travel schedules, this document holder is daily life water resistant and reinforced with accent stitching. SLEEK & PROFESSIONAL：Make a strong first impression with this modern portfolio with a classy piano matte finishing. Fits most briefcases and bags.The cover color coming:Black,Brown,Blue, Pink. IDEAL GIFT :College graduation seeking out their first job? Looking to up your Wall Street game? This is the best gift for him or her! RESUME GOOD HELPER:What interviewers want on your resume?What to wear and bring to your interview?Let this elegant design portfolio help you remember and storage them! If you have any questions about this product by Geila, contact us by completing and submitting the form below. If you are looking for a specif part number, please include it with your message.